Salzburg Lakes Cycle Tour for Regular Cyclists: A cycling tour through the Salzkammergut region, with quiet cycling along lake shores and through beautiful countryside. Not far from the city of Salzburg, the landscape of the Alpine foothills has a charm of its own. Small peaks tower above the pristine lakes, dense forests and lush green meadows. This cycling route takes in imperial towns and picturesque villages, as well as pastures and moorlands. Quaint steamships, including the historic paddle-steamer “Gisela”, and narrow-gauge trains provide fun alternatives to cycling. The route is designed for regular recreational cyclists and includes longer daily stages with more climbs than the “classic” route. Our holidays on this tour of the Austrian lakes include hand-picked accommodation and breakfasts (half-board is an option) in 3* hotels. They also include daily baggage transfers and a comprehensive information pack and guide book, as well as emergency support. 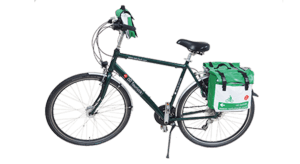 We can also arrange the hire of good quality touring bikes, including electric bikes. This Salzburg Lakes cycle tour passes through very distinct regions, each with their own unique attractions. There is so much to see and do in the beautiful towns and villages along the way, with an incredible selection of cultural attractions such as museums, monasteries, churches, palaces, and galleries, as well as the stunning views of the lakes and mountains. Day 2: Bad Ischl, Approx. 43 miles / 69 km. Day 3: Loop via Bad Hallstattersee, Approx. 38 miles / 61 km (or rest day). Given the variety of accommodation options and the different routes that may be selected between them, all daily distances are approximate. After checking into the hotel and reviewing the route documentation, you should take time to have a look around Salzburg. This lovely city is the fourth largest in Austria and is the birthplace of Mozart. An evening concert at the castle fortress Hohensalzburg is not to be missed. Hire bikes can be collected between 5:30 & 7:00 pm. Your Salzburg Lakes cycle tour starts today! On leaving Salzburg you cycle through pretty villages and small towns, passing the amazing “Drachenwand” (“Dragon Wall”) cliff and enjoying stunning views of the Mondsee and Wolfgangsee lakes. After a swooping descent into the village of St. Gilgen, you continue via Strobl to the “Emperor’s City”, Bad Ischl. Cycle through the Dachstein-Salzkammergut, a UNESCO World Heritage site, via Bad Goisern and on to Lake Hallstättersee, which is framed picturesquely by impressive rock walls. Enjoy the magnificent view of Hallstatt, renowned as one of the world’s most beautiful towns. The Dachstein-Krippenstein cable car offers an excursion high up into the mountain, while the salt mine or the caves offer an excursion into the Dachstein Massif. Hop on the train back to Bad ischl or follow the route along the beautiful Lake Traun. Today your route will take you through the stunning “fjord country” around Traunstein. Take time for a look at “Schloss Ort” before heading through the Aurachtal valley, past the turquoise shimmering Lake Attersee and on to St. Georgen im Attergau, today’s final destination. Today you will follow the turquoise waters of the Attersee to Nussdorf, continuing via the extensive hilly landscape of the legendary Mondsee, which is revealed in all of its stunning splendour. The Trumer See offers lots of natural swimming spots to take a dip in the cool water. The leisurely ride back to Salzburg offers a last chance to enjoy the stunning views of the Salzkammergut region. There are direct flights and trains from Salzburg to many cities, including Vienna and Munich for onward flights to almost anywhere. However, what´s the rush? Why not take time to explore this beautiful, historic, small and friendly city before you leave? We can easily arrange an extension for as long as you like. This Salzburg Lakes cycle tour is available from 28 April to 20 October 2018. With departures every day. The price differs according to season. *This tour can be done by a solo traveller. Payment may be made by credit card (Visa or MasterCard), or by transfer to our Spanish or UK bank. We do not charge a handling fee if you pay by credit card. Child less than 7 years sharing room with 1 or 2 adults: FREE! Child 7-11 years sharing room with 1 or 2 adults: 50%. Child 12-14 years sharing room with 1 or 2 adults: 25%. Child aged 15 years and over or adult sharing room with 2 adults: 10%. No baggage transfers – €36. 7 nights accommodation in specially-selected 3* hotels. Double, twin or family rooms with en-suite bath/shower rooms and free WIFI. Daily luggage transfer – 1 item per person. Maximum weight 20 kg. (Discount if not required). Information pack, including cycle map with detailed English tour description (1 per room). A gift of a high-quality handlebar bag for transportation of travel documents (1 per room). Service hotline, 7 days a week. Travel to and from Salzburg, including flights and airport transfers. Dinners, lunches drinks and snacks (Half-board available). Extra nights in Salzburg or at any point along the route. Tickets for concerts and attractions. 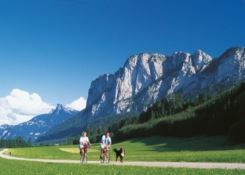 Our Salzburg Lakes cycle tour offers accommodation in 3* hotels, sometimes in 4* hotels in Salzburg. All of the hotels that we use are specially selected for their standards of service, warmth of welcome and character. All offer free WIFI internet access. Your reserved accommodation will usually be confirmed not less than one month before your holiday start date. The Salzburg Lakes cycle tour starts and ends in Salzburg. There are direct flights to Salzburg from many European airports, though it may be more convenient and less expensive to fly to and from Munich or Vienna, from where there are regular train connections which take between 2.5 and 3 hours. Salzburg also has good train connections with many European cities, including London. Please visit the German train website [Click Here] or the Austrian train website [Click Here] to check times. There is also a very good road network connecting Salzburg with the rest of Europe. If you travel by car, your arrival hotel can offer a few parking spaces on a “first come, first served” basis only. Paid parking is available at the Linzer Gasse Garage (access Glockengasse, approx. a 4 minutes’ walk to the centre), for approximately €60 per week / €80 for 2 weeks. For further information please call: +43-(0)662-878444. We would be very happy to arrange your flights and / or transfers. Please ask for details. Our most popular bike is the 21-speed hybrid, which is available in men’s and women’s models. 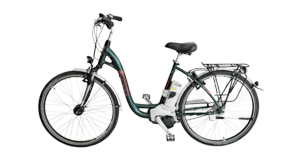 We can also supply 7-speed unisex touring bikes with back-pedal “coaster” brakes, as well as electric bikes. Please see “Prices” for hire charges. All adult rental bikes are equipped with a speedometer. 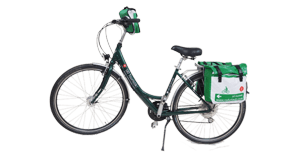 One bike per room is equipped with double pannier bags for the carriage of spare clothing and food, as well as a handlebar bag for the carriage of documents, maps and other small items. Helmets are compulsory for children aged under 12 years and are recommended for everyone. They can be purchased locally. If extra nights are booked there is no supplement for the use of hire bikes. However, their use in Salzburg is always subject to availability. This is the “Sporty” version of the cycling tour of the Austrian lakes. It is an intermediate (hard/moderate) tour, designed for regular recreational cyclists with a reasonable level of fitness. The route includes some climbs, but is clearly marked and is generally smooth and traffic-free. There is sometimes the option of shortening or skipping legs by taking a bus, boat or train. There is also the option of taking a break from cycling on days 3 and 5. Electric bikes are available for hire. On an electric bike, the tour should be within the capabilities of novice cyclists. This is an unescorted cycle tour. The mileages given are approximate and are based on the suggested routes. Daily luggage transfers are included in the price of this Salzburg Lakes cycle tour. There is a strict limit of 1 piece of luggage per person and it must not weight more than 20 kg. It is usually possible to leave extra luggage at the hotel in Salzburg. A discount is available if luggage transfers are not required. The weather in Austria between April and October can be very changeable. Please check the weather forecasts and be prepared. It will almost always be necessary to carry a waterproof jacket and waterproof trousers may also be required at times. All items carried on the bike should be wrapped in plastic to avoid soaking. A sun hat and sunscreen are often also essential.